The past two days have been quite awakening in regards to the nature of my job. Risky. Very risky. On Friday, I read a story in the Daily Monitor by Flavia Lanyero about the July 11 2010 Kampala bombing that left 74 dead. Titled “Engineering dream bombed to shreds,” the story brought back memories of how I narrowly missed the blast by 15 minutes with Felix Eupal, a colleague of mine at The Observernewspaper. 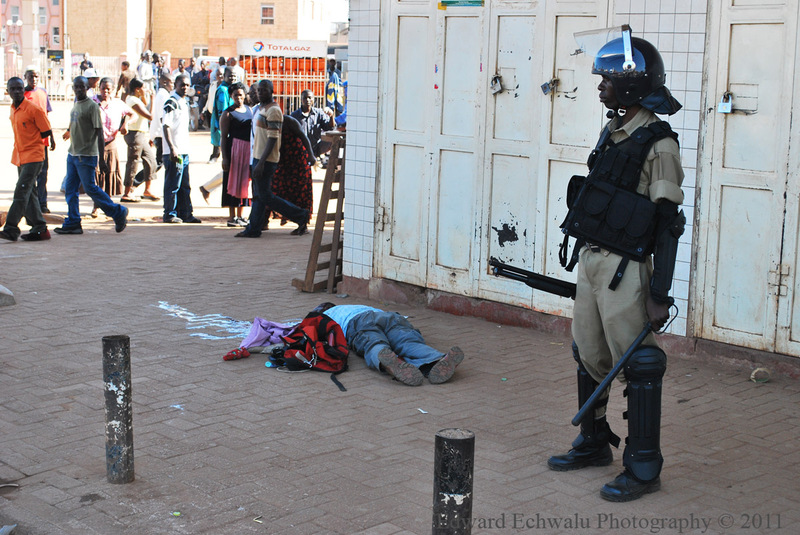 I was threatened by eight soldiers among whom was one who had pulled the trigger not shoot this pictures in the recent Besigye riots in Kampala . Lucky for me, I had shot about 6 frames within 10 seconds. The soldiers threatened to crash my camera if I didn’t move. I eventually moved because they acted confused and trigger happy too. It was the World Cup final after-all which had to get the best coverage. In Kampala, several venues had organized gigs to attract soccer loving fans. A few hours before game time, we started hopping from one venue to another recording the different atmosphere’s leading to the game. The buzz was electronic and Magnetic. It was unbelievable for a soccer fan. “Where should we lift this trophy from?”I remember asking Felix. Steak Out, Nakivubo Stadium, Slow Boat, UBC, Kyadondo Rugby Club were some of the areas we’d mapped out to visit before, during and after the game. By half time, we’d rounded all but UBC. Kyandondo Rugby Club where we watched the first half was Felix’s favourite hangout joint. I know deep down, he was desperate to finish off the night here. Kyadondo was really full of life. Musicians performed, Vuvuzelas were blown while people danced and danced and danced. At UBC, a friend of ours insistently kept calling. She needed our company but, we kept giving ourselves “extra time.” Every time a call came in, we gave ourselves 5, 3, 4 or 2 extra minutes. Having run out of minutes, excuses and afraid of a possible red card by her, we set off for UBC. It took us about seven minutes. We were just settling in before we witnessed a panic on people’s faces. The gate was immediately closed and the MC assured us everything was under control. A few seconds later, news was now coming that there has been a bomb blast at Kyadondo. 74 lives ended. And I survived. I got arrested and then beaten by UPDF soldiers after taking this picture during the 2009 Buganda riots before being released after they forcefully deleted it off my camera. They accused me uncovering their tracks. The story of my release is a long one but I can only say, the last 100/= airtime in my phone saved me that day otherwise; I was destined for more torture at an army barracks. 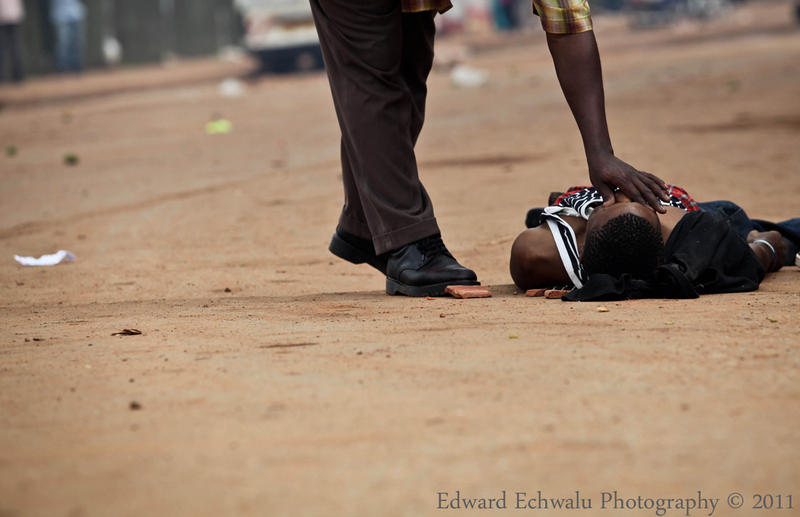 Reading Lanyero’s story reminds me of how dangerous a photojournalists’ working environment can get. We have to be there though, to tell story, to remind our governments about the repercussion of some of their actions and responsibilities too. Without cameras, the impact of the July 11 would have been at best, minimal. We are sometimes called mad but few really understand the obsession that comes with telling a story. In the same respect is a special report in The Guardian of “shots” that nearly had photographers killed. Last month two award winning photographers in Chris Hondros(Getty Images) and Tim Hetherington (Panos) were killed while on the frontline in Libya in the ongoing battle between Gadaffi and the rebels. Locally, photographers/videographers have been threatened, beaten and had their camera’s confiscated just because they are on the front-line with a desire to tell a good story. I am reading this and I am thinking-death aint nothing but a heart beat away. For us it could be a gunshot away for capturing an image!! Its only God who can protect us. Edward – you did it! Most needed, wonderful. A very vivid delivery,BIG UP! More of smthg like ‘Photographers who dare’….but its always worth the risk.God wl see you thru al….the best!